Download "Discectomy. Cervical discectomy is considered not medically necessary for the treatment of cervical herniated disc"
2 with an endoscope or other type of cameras), and 3) removes disc and other surgical products by direct visualization through the surgical incision. Microdiscectomy may be done with adjunctive devices, such as tubular retractors to improve visualization, or endoscopy to localize the correct areas to operate. However, removal of the disc itself must be done under direct visualization in order to be considered microdiscectomy. Cervical discectomy refers to open anterior cervical discectomy (with or without fusion), or minimally invasive posterior cervical discectomy/foraminotomy. There are numerous other alternative procedures for performing discectomy, with uncertain efficacy compared with standard procedures. 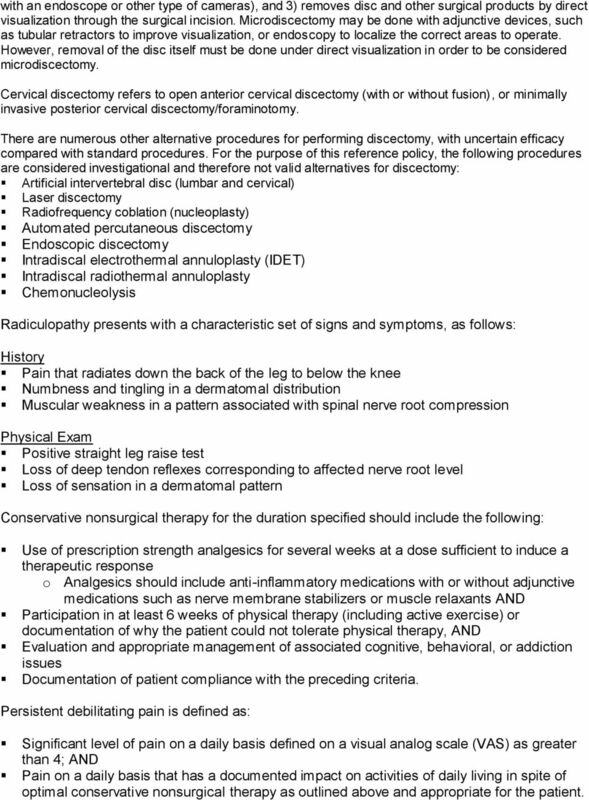 For the purpose of this reference policy, the following procedures are considered investigational and therefore not valid alternatives for discectomy: Artificial intervertebral disc (lumbar and cervical) Laser discectomy Radiofrequency coblation (nucleoplasty) Automated percutaneous discectomy Endoscopic discectomy Intradiscal electrothermal annuloplasty (IDET) Intradiscal radiothermal annuloplasty Chemonucleolysis Radiculopathy presents with a characteristic set of signs and symptoms, as follows: History Pain that radiates down the back of the leg to below the knee Numbness and tingling in a dermatomal distribution Muscular weakness in a pattern associated with spinal nerve root compression Physical Exam Positive straight leg raise test Loss of deep tendon reflexes corresponding to affected nerve root level Loss of sensation in a dermatomal pattern Conservative nonsurgical therapy for the duration specified should include the following: Use of prescription strength analgesics for several weeks at a dose sufficient to induce a therapeutic response o Analgesics should include anti-inflammatory medications with or without adjunctive medications such as nerve membrane stabilizers or muscle relaxants AND Participation in at least 6 weeks of physical therapy (including active exercise) or documentation of why the patient could not tolerate physical therapy, AND Evaluation and appropriate management of associated cognitive, behavioral, or addiction issues Documentation of patient compliance with the preceding criteria. Persistent debilitating pain is defined as: Significant level of pain on a daily basis defined on a visual analog scale (VAS) as greater than 4; AND Pain on a daily basis that has a documented impact on activities of daily living in spite of optimal conservative nonsurgical therapy as outlined above and appropriate for the patient. 5 is usually reserved for smaller herniations in which a smaller amount of tissue needs to be removed. 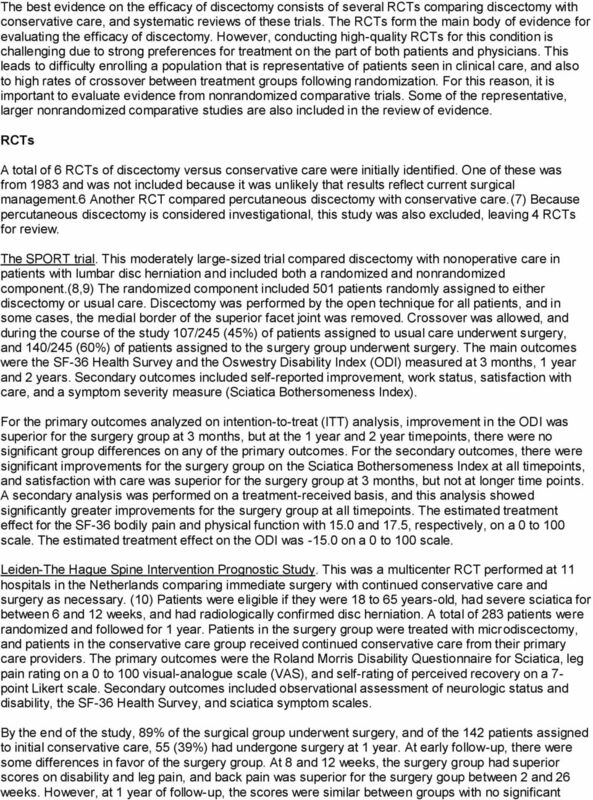 A few controlled trials of open discectomy versus microdiscectomy have been published, and have reported that neither procedure is clearly superior to the other but that microdiscectomy is associated with more rapid recovery. 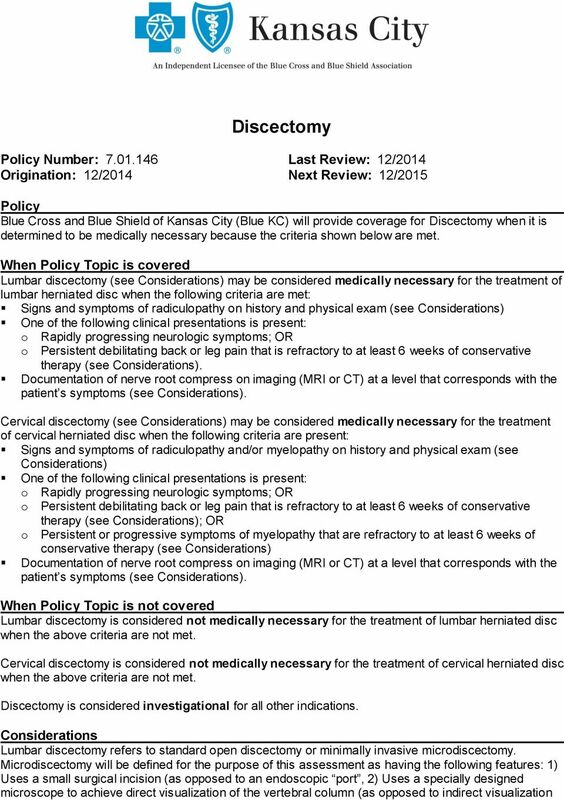 (4,5) Cervical discectomy. The most common procedure for cervical discectomy is anterior cervical discectomy (ACD). This is an open procedure in which the cervical spine is approached through an incision in the anterior neck. Soft tissues and muscles are separated to expose the spine. The disc is removed using direct visualization. This procedure can be done with or without spinal fusion, but most commonly it is performed together with fusion (ACDF). An alternate, less invasive procedure for cervical discectomy is posterior cervical discectomy/foraminotomy. This is performed through a small incision in the back of the neck. The nerves and muscles are separated using a small retractor. The spine is visualized with microscopic guidance, and a portion of the spine, the foramen, is removed to expose the spinal canal. Special instruments are used to remove a portion of the disc or the entire disc. Complications of discectomy in general include bleeding, infections, and inadvertent nerve injuries. Dural puncture occurs in a few percent of patients, leading to leakage of cerebrospinal fluid that can be accompanied by headaches and/or neck stiffness. In a small percentage of cases, worsening of neurologic symptoms can occur post-surgery. 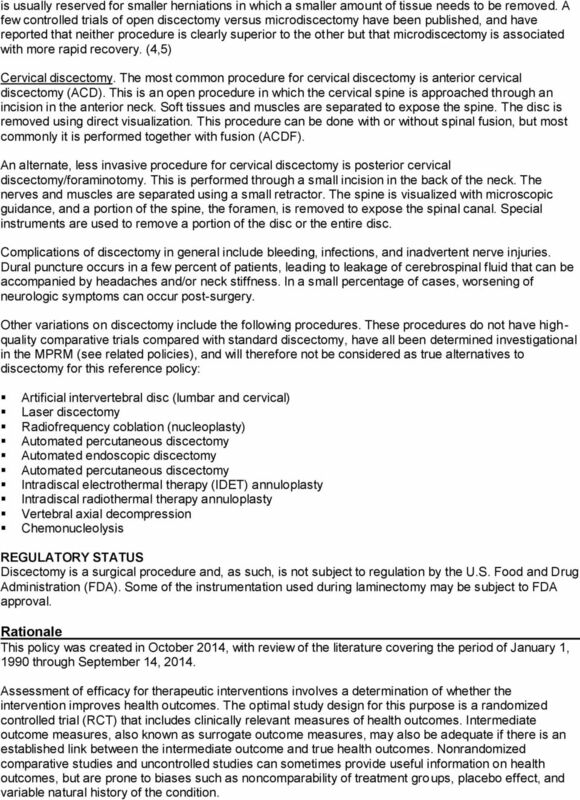 Other variations on discectomy include the following procedures. 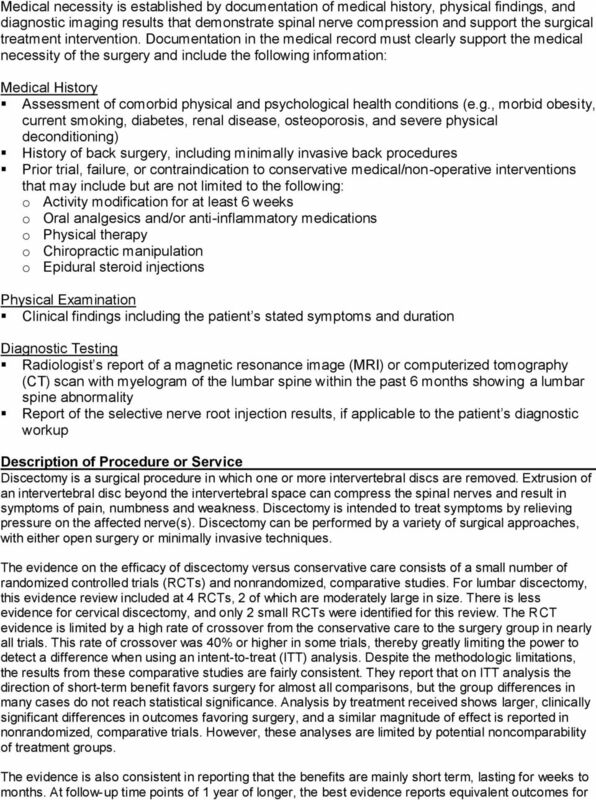 These procedures do not have highquality comparative trials compared with standard discectomy, have all been determined investigational in the MPRM (see related policies), and will therefore not be considered as true alternatives to discectomy for this reference policy: Artificial intervertebral disc (lumbar and cervical) Laser discectomy Radiofrequency coblation (nucleoplasty) Automated percutaneous discectomy Automated endoscopic discectomy Automated percutaneous discectomy Intradiscal electrothermal therapy (IDET) annuloplasty Intradiscal radiothermal therapy annuloplasty Vertebral axial decompression Chemonucleolysis REGULATORY STATUS Discectomy is a surgical procedure and, as such, is not subject to regulation by the U.S. Food and Drug Administration (FDA). Some of the instrumentation used during laminectomy may be subject to FDA approval. Rationale This policy was created in October 2014, with review of the literature covering the period of January 1, 1990 through September 14, Assessment of efficacy for therapeutic interventions involves a determination of whether the intervention improves health outcomes. The optimal study design for this purpose is a randomized controlled trial (RCT) that includes clinically relevant measures of health outcomes. Intermediate outcome measures, also known as surrogate outcome measures, may also be adequate if there is an established link between the intermediate outcome and true health outcomes. Nonrandomized comparative studies and uncontrolled studies can sometimes provide useful information on health outcomes, but are prone to biases such as noncomparability of treatment groups, placebo effect, and variable natural history of the condition. 8 surgical variations. For the main outcome of overall recovery, surgery was better than exercise therapy, traction, and percutaneous discectomy. However, for the outcome of pain, disc surgery was not found to be better than alternative treatments. Chou et al published a systematic review of the evidence for efficacy of different surgical procedures for back pain, in conjunction with development of clinical guidelines by the American Pain Society. 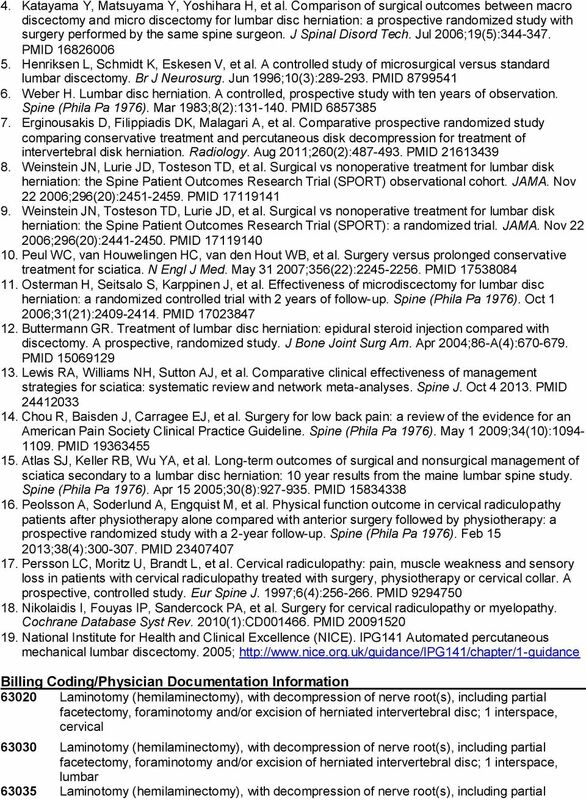 (14) For the question of discectomy versus nonsurgical care, 4 studies were included, 3 of which were previously reviewed. The studies were not pooled. 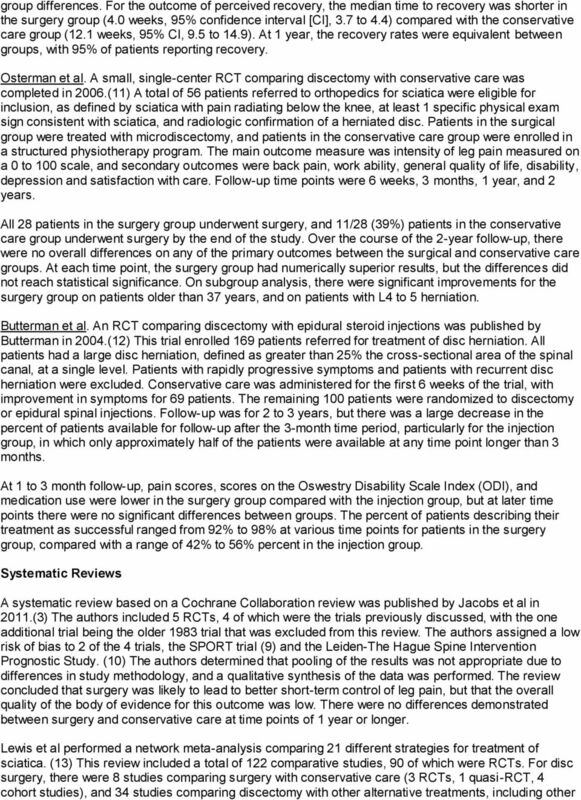 The conclusions of this evidence review were that discectomy, performed either by open surgery or microdiscectomy, had superior outcomes of pain and disability at up to 3 months, but no definite benefit at longer time points. Nonrandomized, Comparative Studies The observational cohort component of the SPORT trial enrolled patients who met the eligibility criteria for the SPORT RCT but who declined randomization to treatment group. (8) A total of 743 patients were enrolled, 528 underwent discectomy and 191 were treated with conservative care. The primary outcomes (SF-36 health status survey and ODI) and secondary outcomes (self-reported improvement, work status, satisfaction, symptom severity) were the same as for the RCT, and follow-up was according to same schedule of 3 months, 1 year, and 2 years. Follow-up ranged between 82% to 89% for different time points. Study results reported that the surgery group had superior improvements at 2 years on all primary and secondary outcome measures, except work status. The treatment effect as measured by the SF-36 bodily pain was 10.2 (95% CI, 5.9 to 14.5), the treatment effect of the SF-36 physical function measure was 12.0 (95% CI, 7.9 to 16.1), and the treatment effect of the ODI was (95% CI, to -9.7). 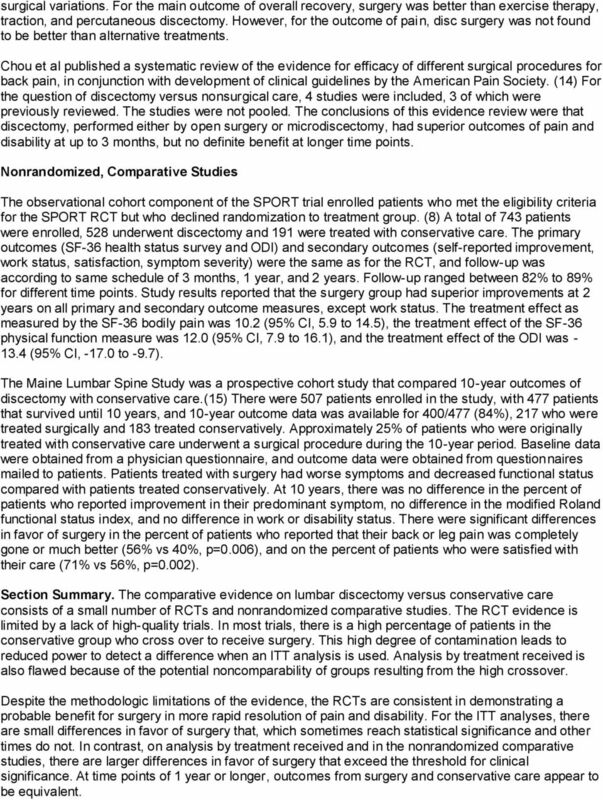 The Maine Lumbar Spine Study was a prospective cohort study that compared 10-year outcomes of discectomy with conservative care. (15) There were 507 patients enrolled in the study, with 477 patients that survived until 10 years, and 10-year outcome data was available for 400/477 (84%), 217 who were treated surgically and 183 treated conservatively. Approximately 25% of patients who were originally treated with conservative care underwent a surgical procedure during the 10-year period. Baseline data were obtained from a physician questionnaire, and outcome data were obtained from questionnaires mailed to patients. Patients treated with surgery had worse symptoms and decreased functional status compared with patients treated conservatively. At 10 years, there was no difference in the percent of patients who reported improvement in their predominant symptom, no difference in the modified Roland functional status index, and no difference in work or disability status. There were significant differences in favor of surgery in the percent of patients who reported that their back or leg pain was completely gone or much better (56% vs 40%, p=0.006), and on the percent of patients who were satisfied with their care (71% vs 56%, p=0.002). Section Summary. 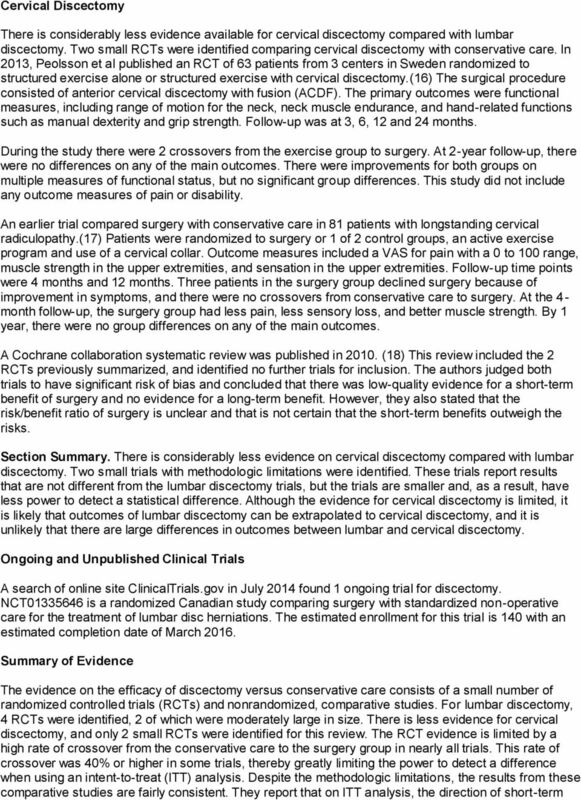 The comparative evidence on lumbar discectomy versus conservative care consists of a small number of RCTs and nonrandomized comparative studies. The RCT evidence is limited by a lack of high-quality trials. In most trials, there is a high percentage of patients in the conservative group who cross over to receive surgery. This high degree of contamination leads to reduced power to detect a difference when an ITT analysis is used. Analysis by treatment received is also flawed because of the potential noncomparability of groups resulting from the high crossover. Despite the methodologic limitations of the evidence, the RCTs are consistent in demonstrating a probable benefit for surgery in more rapid resolution of pain and disability. For the ITT analyses, there are small differences in favor of surgery that, which sometimes reach statistical significance and other times do not. In contrast, on analysis by treatment received and in the nonrandomized comparative studies, there are larger differences in favor of surgery that exceed the threshold for clinical significance. At time points of 1 year or longer, outcomes from surgery and conservative care appear to be equivalent. 12 facetectomy, foraminotomy and/or excision of herniated intervertebral disc; each additional interspace, cervical or lumbar (List separately in addition to code for primary procedure) Laminotomy (hemilaminectomy), with decompression of nerve root(s), including partial facetectomy, foraminotomy and/or excision of herniated intervertebral disc, reexploration, single interspace; cervical Laminotomy (hemilaminectomy), with decompression of nerve root(s), including partial facetectomy, foraminotomy and/or excision of herniated intervertebral disc, reexploration, single interspace; lumbar Laminotomy (hemilaminectomy), with decompression of nerve root(s), including partial facetectomy, foraminotomy and/or excision of herniated intervertebral disc, reexploration, single interspace; each additional cervical interspace (List separately in addition to code for primary procedure) Laminotomy (hemilaminectomy), with decompression of nerve root(s), including partial facetectomy, foraminotomy and/or excision of herniated intervertebral disc, reexploration, single interspace; each additional lumbar interspace (List separately in addition to code for primary procedure) Transpedicular approach with decompression of spinal cord, equina and/or nerve root(s) (eg, herniated intervertebral disc), single segment; lumbar (including transfacet, or lateral extraforaminal approach) (eg, far lateral herniated intervertebral disc) Transpedicular approach with decompression of spinal cord, equina and/or nerve root(s) (eg, herniated intervertebral disc), single segment; each additional segment, thoracic or lumbar (List separately in addition to code for primary procedure) Discectomy, anterior, with decompression of spinal cord and/or nerve root(s), including osteophytectomy; cervical, single interspace Discectomy, anterior, with decompression of spinal cord and/or nerve root(s), including osteophytectomy; cervical, each additional interspace (List separately in addition to code for primary procedure) C2614 Probe, percutaneous lumbar discectomy Additional Policy Key Words N/A Policy Implementation/Update Information 12/1/14 New Policy. Discectomy is medically necessary for the treatment of herniated disc when symptoms are refractory to conservative care and criteria are met. State and Federal mandates and health plan contract language, including specific provisions/exclusions, take precedence over Medical Policy and must be considered first in determining eligibility for coverage. 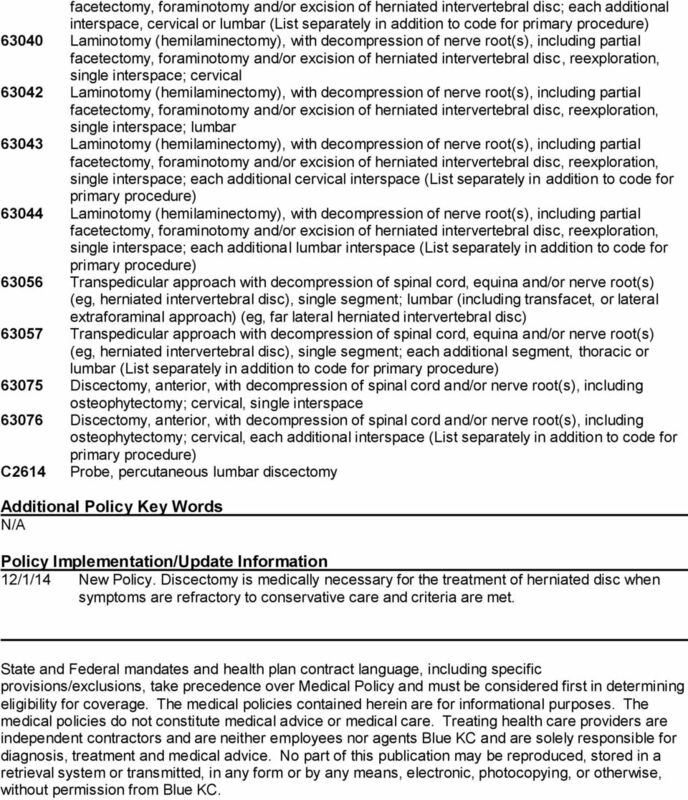 The medical policies contained herein are for informational purposes. The medical policies do not constitute medical advice or medical care. Treating health care providers are independent contractors and are neither employees nor agents Blue KC and are solely responsible for diagnosis, treatment and medical advice. No part of this publication may be reproduced, stored in a retrieval system or transmitted, in any form or by any means, electronic, photocopying, or otherwise, without permission from Blue KC. 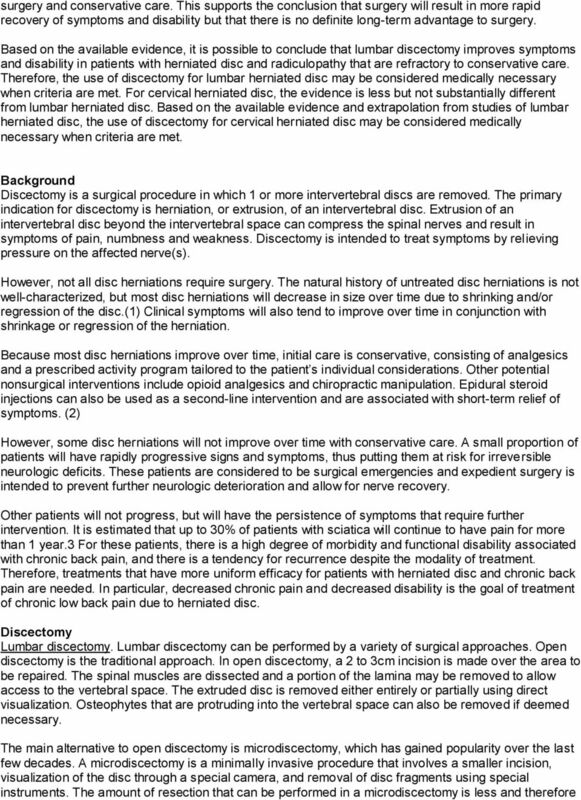 Open Discectomy North American Spine Society Public Education Series What Is Open Discectomy? Open discectomy is the most common surgical treatment for ruptured or herniated discs of the lumbar spine. Effective Date: 01/01/2012 Revision Date: 07/24/2013 Comments: Policy Accepted during 2013 Annual Review with no changes. Low Back Pain (LBP) Prevalence. Low Back Pain (LBP) Prevalence. Lumbar Fusion: Where is the Evidence? MEDICAL POLICY. 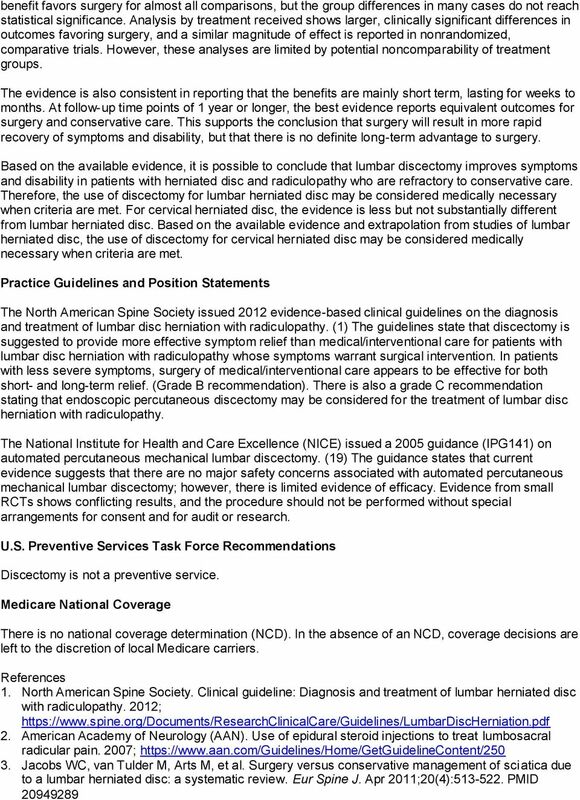 [TOP] Lumbar spine decompression surgery may be considered medically necessary when applicable criteria are met. 10801 Sixth St, Suite 120 Rancho Cucamonga, CA 91730 Tel (909) 890-2000 Fax (909) 890-2003 Visit our web site at: www.iehp.org. The Surgical Spine. Sergio Rivero M.D. Minimally Invasive Spine Surgery What is it and how will it benefit patients? White Paper: Cervical Disc Replacement: When is the Mobi-C Cervical Disc Medically Necessary?